Beth Jo Zeitzer is the President and Designated Broker ofR.O.I. Properties, a full-service real estate advisory and brokerage firm based in Phoenix. Before founding R.O.I. Properties, Beth Jo, served as the Director of Commercial Properties at Del Webb Corporation where she handled $96 million in real estate transactions and a 600-acre commercial property portfolio which included: regional and neighborhood retail centers, business, medical and professional offices, industrial parks, and light industrial spaces. She is experienced in commercial development including planning, entitlement, infrastructure delivery, budgeting and financial oversight, marketing analysis, sales and marketing, contract negotiation, design review, and construction monitoring. Beth Jo is a licensed attorney in Arizona and California and a licensed real estate Broker in Arizona. An Arizona resident since 1971, Beth Jo graduated from the University of Arizona with a B.A. in General Research (with Real Estate and Marketing emphasis). She is also a graduate of the University of San Diego Law School, where she was the Research Editor of the Law Review and the recipient of the Hahn Award for Excellence in Real Estate. Any legal matter involving disputed assets can get complicated quickly—particularly when it involves the ownership, use, occupancy, or financial benefit associated with a jointly owned property. In such circumstances, a court-appointed party such as a Special Real Estate Commissioner or Special Master, Receiver, or neutral broker with specific real estate expertise can deliver a faster, less contentious, and cost-effective resolution for attorneys as well as their clients. While receivership, divorce and family law, bankruptcy, and probate are vastly different from a legal perspective, the common thread with regard to real estate dispute resolution is the use of court-supervised sales. In most instances, each of these legal proceedings involves a court order or other court-supervised proceeding that allows the receiver, Special Real Estate Commissioner, bankruptcy trustee, or fiduciary to sell real estate assets. The court-appointed expert is responsible for understanding the court’s expectations; determining what the parties want to achieve and/ or what the court order requires; identifying potential buyers and procuring their interest; and valuing, managing and selling the property or properties. For many transactions, the courtauthorized expert also must be prepared for the inquiry of the judge—which means presenting all relevant information and history regarding the valuation, marketing, management and contract-negotiation process. The following is a brief summary of the types of neutral real estate experts who can be appointed and the most common cases in which they’re applicable. When there has been a monetary or other default in loan documents and/or a dispute among parties, a receiver is a court-appointed officer charged with taking possession of and protecting assets as set forth in A.R.S. § 12-1242 and Rule 66, Arizona Rules of Civil Procedure. As a result, receivership can be used by anyone who needs to level the playing field, whether business litigators, divorce attorneys or probate litigators. In brief, the receiver is responsible for performing financial and physical forensics/ due diligence to understand the assets and liabilities of the receivership estate; assessing the risks and the rewards; and developing a stabilization, turnaround and/or disposition strategy. Where there are real estate assets within a receivership estate, ideally the real estate assets should be sold while a receivership action is pending. This allows the receiver to stabilize the asset, create buzz (since it’s off-market or premarket), negotiate more favorable contracts and leases, and create a solid due-diligence package. It also can enable a lender to avoid liability issues arising from potential environmental, occupancy, and operating business issues, and facilitate an expedited sale with court oversight and approval. While real property is not the only aspect of legal disputes, it is often one of the most contentious from a financial and even emotional perspective. It’s important to note that while Arizona has a receivership statute, we do not yet have a wide body of case law. Nevertheless, Arizona courts will look to other jurisdictions for case law as precedent-setting in this area. In divorce and family law cases, Special Real Estate Commissioners are commonly used to value and sell property where the parties cannot otherwise agree on how to proceed with real estate assets that are a part of the community assets. A Special Real Estate Commissioner is a licensed real estate broker responsible for initiating and completing the sale of real property. Governed by Rule 95G of the Arizona Rules of Family Law Procedure implemented Jan. 1, 2006, a Special Real Estate Commissioner assists the parties with disposition of community real property when the parties are otherwise unable to agree on such issues. Finally, a Special Real Estate Commissioner can be used to resolve partition disputes (governing authority A.R.S. § 12- 1218), when a property held by co-tenants (e.g., joint tenants, tenants -in-common or community property) is incapable of fair division, sale, or distribution of proceeds. In some cases, dividing and selling the property might depreciate the value (or be physically impossible, such as an income-producing property or single-family home), or the parties disagree on whether it should be sold or managed. In such cases, the Special Commissioner will be directed to sell the property and return the proceeds into court to be divided between the parties according to their respective interests— and after payment of any mortgages, liens, commissions and escrow fees. As far as process, a standard order will require the party in possession to contact the Special Commissioner within 10 days, at which point the marketing/valuation/ listing process begins. Special orders may include provisions about access, showing times, reporting intervals, short sales/ foreclosures, and other details. Note that in cases where there is an operating business involved (e.g., hotels, ministorage businesses, apartments, shopping centers, gas stations), the appropriate route is to appoint a Special Master with Receiver authority who assumes control over the bank accounts and financials, and helps manage the properties as well as addressing any health and safety concerns. The goal, as above, is to create a baseline understanding and equitable understanding between all parties about operations and financials. In bankruptcy matters, brokers may be court appointed to sell property. Typically, the bankruptcy trustee or a debtor-in-possession will hire a real estate broker, subject to Bankruptcy Court approval, to market and sell the asset in order to pay the secured creditors in full and make a distribution to unsecured creditors. In some instances, a trustee or debtor can sell real estate assets free and clear of liens, even though a lender is not being paid in full. The trustee also can sell co-owned property, where a co-owner is not in bankruptcy—which can be a very powerful tool. Although each type of court-supervised sale has its own specific steps, the common element is a focus on limiting liability for the various parties while maximizing the value of the real estate assets at issue: i.e., achieving highest/best pricing within the established timeline. Court appointments don’t necessarily require liquidation of the disputed property. For instance, a skilled Receiver may rehabilitate an asset and its systems to the point that business partners, spouses or beneficiaries can engage in equitable settlement negotiations, which is tantamount to an infor-mal mediation. When a sale does occur, it should be as-is, where-is, without representation and warranties, and subject to court approval/oversight (which may include higher/better bidders at court approval, such as in bankruptcy and fiduciary proceedings). While real property is not the only aspect of legal disputes, it is often one of the most contentious from a financial and even emotional perspective. Court-ordered sales are not as simple as listing and negotiating a property on the open market, given the numerous rules, regulations and checkpoints in place to protect all parties. For that reason, enlisting an expert with real estate acumen as well as experience in adversarial/ litigious environments can be a significant benefit. Compared to extended litigation, the use of a Special Real Estate Commissioner or Special Master, Receiver or neutral broker can often be less costly and complicated—as well as more expedient—for attorneys (and their clients) seeking equitable resolution in disputes that involve real estate. There are many ways for small businesses to enter the commercial real estate market in Arizona. Businesses can start by leasing property, move to own their own facilities, rent a portion of the facilities for additional income stream, and or sell and leaseback their facilities for maximum return on their investment. No matter how you enter the Arizona commercial real estate market as a business owner, you are going to have to do some research to learn to navigate your way through the process of purchasing. Upon deciding to purchase commercial property in Arizona, you should do two things. First, you will want to be sure that you have the appropriate capital, whether equity, debt or a portion of both. Second, you should find a knowledgeable commercial real estate broker to guide you through the process. The capital piece can be made easier through the right capital (equity and debt) sources. There are traditional forms of financing, such as obtaining a mortgage through a large bank and there are nontraditional avenues such as finding private investors to invest in your company. The intricacies of funding will not be covered here, but you should understand that it is essential to be proactive regarding all of the steps of the purchasing process. Finding the right commercial real estate broker may seem easy, but it can be a challenge. You will need to look for a firm that is familiar with the ins and outs of your specific industry and real estate needs associated with this industry. You want to search out a broker that is well versed in the laws and regulations behind your type of business. Finally, it helps to have someone that is experienced in both the commercial real estate industry and the industry in which you conduct business. Once you have the finance and broker pieces of the puzzle together, you can dive into looking at specific properties that suit your needs. If you found a great full-service commercial real estate broker, they will likely have a vast amount of inventory for you to review. Looking at many properties is excellent, and you should always go into each viewing with an open mind. A lot of the time, business owners judge a listing by the photos they see, and will tell their broker that they are not interested in seeing a property. If you have the time, always go and look at sites that your broker thinks may be a good fit for your business. If they are well versed in your field, they probably have a good idea of what will fit and what won’t. Once your search is narrowed down to a few choices, sit down and think about which property is the right fit for you. Business owners will often jump on the first property that they see, only to realize after moving in that they need to make significant changes to the layout, or that it is too far away for some of their current employees to travel to on a daily basis. Sitting down with your real estate broker and fitting all of the pros and cons of each property to your business model will help you to make the right choice in the end. Remember, you are purchasing property, this is a long-term investment in your business. Carefully considering how the new location will affect each aspect of your business is highly recommended. Once you decide on a property your knowledgeable commercial real estate broker will guide you through the rest of the process. Depending on the property, if there are any structures on it, and what type of financing you have chosen, you may need to have multiple professional inspections done. There may also be requirements that the property and the title are surveyed. Once you have secured your small business real estate, you are on your way to starting out in your new location. R.O.I Properties offers decades of experience in the commercial real estate industry in Phoenix, Arizona. Our brokers can help you figure out what the individual pros and cons of owning vs. leasing would be for your specific industry and stage of business development. Give us a call today. We would love to help you get the best commercial real estate deal possible in the Greater Phoenix Area. Getting into commercial real estate as an established or new business can be a complicated process. Rather than fear it, this article will help you think through factors for success. When considering relocating and finding a property for your business, you have choices. The two main options are to buy the property where you operate your business, or lease a location. 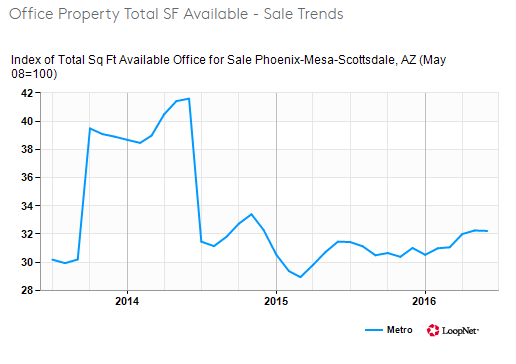 In growing areas like Phoenix, as demand for commercial real estate inventory increases, the value of the property also increases over time. Commercial property owners often have the luxury of realizing significant profits from a sale after holding the property for several years. When a business owner pursues conventional financing for a commercial real estate purchase, the principal is paid off, and the business gains equity. This equity reduces the overall debt load on the company. Owning property and keeping up with your mortgage payments will give your business a solid foundation of credit over time. When you own the building that you occupy, you have full control over how the building is managed and the physical changes that are implemented. As your business grows and changes if you need to knock down walls or install new equipment you are free to do so. Parts of the property or the property in its entirety can be leased out to other occupants. Leasing generates a stream of alternative income for your business or owner. Additional revenue can be used to pay the mortgage, be saved for a rainy day, or for other projects. There are many tax advantages to owning commercial property. For example, the amount of interest paid on your mortgage may be tax deductible as well as certain repairs or upgrades that would not be tax deductible if you were leasing a property. Business owners that chose to purchase commercial property for their businesses usually plan to stay at the location for a minimum of five years. Purchasing property locks you into a site for a longer time than the average lease. You are also locked into a payment agreement with your lender, and these are usually 10-20 year obligations. Some may penalize you for paying the loan down early, although this is generally negotiable. In addition to this, you may have issues securing funding for things like an expansion if your business grows at a faster than projected pace. Purchasing commercial property is a bit different from residential property. Often banks and other traditional lenders are looking for a 20% to 30% down payment, but Small Business Association loans generally require only 10% down. A down payment can temporarily tie up a significant amount of working capital for a business. Depending on the size and location of the property, building management costs can become a burden. Other issues include health and safety inspections, contractor management, and legal compliance. One of the main advantages to leasing business property is that there is often a wider variety of possible locations for your business. Many businesses that require a storefront and foot traffic may have limited choices when it comes to buying a property outright. When you lease space, you are only required to pay on the lease for the agreed upon amount of time. Leasing in a building with many other units allows for easy expansion into additional vacant space if you should need it as your business grows. There is usually a smaller deposit (as opposed to a down payment) to lease a property. Not having to make a 10-30% down payment frees up cash flow for your business to invest in equipment and other items necessary for operation. Leasing property can help your business to grow a positive credit history if you keep up with your payments and on good terms with the lease. Your record of leasing can help you to secure financing to eventually purchase property or invest in your business in the future. When you lease a location, depending upon how the lease is structured, you may not be responsible for extra costs such as building maintenance and other unforeseen expenses that can come up for property owners. Having few unknown costs on your balance sheet is positive in the eye of lenders. For example, if you are looking for a business loan, the stability of your overall costs will factor in your favor. There may also be tax benefits to leasing, as your lease and occupancy costs may be deductible as business operation costs. When a business leases a property, the company may not be responsible for overall maintenance and care for the property. The absence of these responsibilities, if the lease is structured in this way, leaves the business owner to focus solely on their business without the worry about the ins and outs of taking care of a property as well. A business with a strong balance sheet and extra cash flow to put down a down payment hurts itself by missing out on the advantages of owning commercial property. Leasing is likely more expensive than owning, in the long run. If your business is established and you have the cash to purchase, you should seriously consider doing so. When you lease a location, you do not benefit from the property appreciating in value over time. You end up losing money on this end because as the value of the building you are occupying increases your leasing rates will increase as well. When you enter into a lease agreement, you want to be 100% sure that you fully understand your rights and how you are to treat the property. Breaching a lease agreement can be very costly, and you want to avoid doing so. Many businesses will have to install equipment or make changes to the property so that they can perform their work as needed. These changes have been agreed upon, but once the lease is over the business owner usually must remove all changes made at their own expense. As a tenant, you have little control over property operations. You cannot choose the people or businesses that move into other parts of the building or the people that are put in place to run the building. Whether to own or lease property is a decision that a business owner should make, utilizing the guidance of a trusted commercial real estate broker, and evaluating numerous factors. Now that you are aware of the substantial differences and intricacies between owning and leasing, you should consider talking to an experienced professional commercial real estate broker. A professional and knowledgeable broker will help get you started on your journey to the perfect property for your business, whether leased or owned. R.O.I Properties has decades of experience in the commercial real estate industry in The Greater Phoenix Area. Our brokers can help you figure out what the individual pros and cons of owning vs. leasing would be for your specific business. Contact us today. We would welcome the opportunity to assist you in making the best commercial real estate decision for you/your business. Business is booming in Phoenix, Arizona. 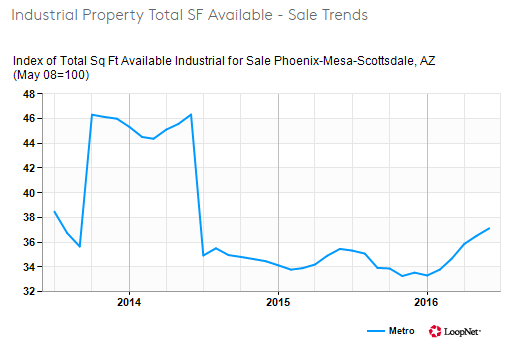 The gross domestic product has gone up 5% each year for the Greater Phoenix Area since the bottom of the Great Recession in 2009 according to FRED data. Additionally, the commercial real estate market is on fire. The number of vacancies for industrial, retail, and office space is at or near the lows for the last four years, except for retail space. This situation means that the market is tight, and it is a sellers’ market at the moment. With commercial real estate inventories at lows, this means that there are fewer properties available and that current owners will be looking for higher lease rates and sale prices. When the commercial real estate market is in this type of situation, businesses looking to secure a new location to consider their options carefully. 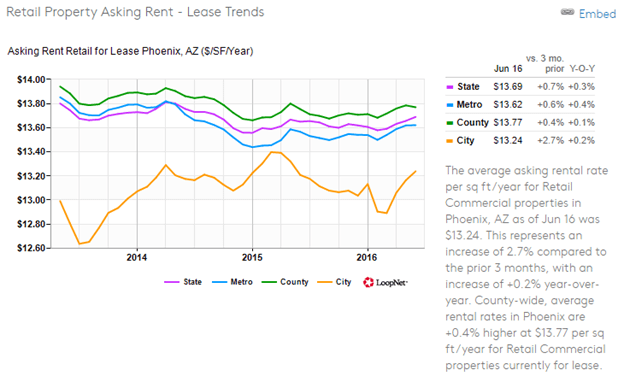 The information in these charts tells us that there is more retail space available for sale and that the cost of leasing retail space has not gone up significantly over the last four years. Both the industrial and office space real estate sectors remain tight as lease rates have been rising steadily and there has been no recent significant increase in inventory over the last four years. Depending on your sector of business, you may have an easier or harder time finding new space for your business. To find the best property for your business, seek a knowledgeable commercial real estate broker. When looking for a commercial real estate broker, you want to be sure they have experience, understand the industry landscape that you are in, and are well networked in your local area. The industrial real estate market as seen from the charts above has been strong over the last four years. Some of the larger businesses that have been moving into the area over the previous year include Conair and UPS. While market supply has been decreasing large amounts of space, have been added as well. This is demonstrative of growing demand over the last four years. Between 2014 and 2016 about 6 million square feet of industrial workspace was added each year and 7 million square feet were added in 2017. If industrial businesses continue to move into the area at the current rate the market will become tighter. Much of the recent activity in the office commercial real estate market in Phoenix has involved companies making lateral moves, primarily in relocation to places for convenience reasons. While the market has remained tight, this means that office space vacancy choices are more robust than in the industrial sector. One example to note is Quicken Loans; they are moving into a 150,000 square foot space in downtown Phoenix this year. 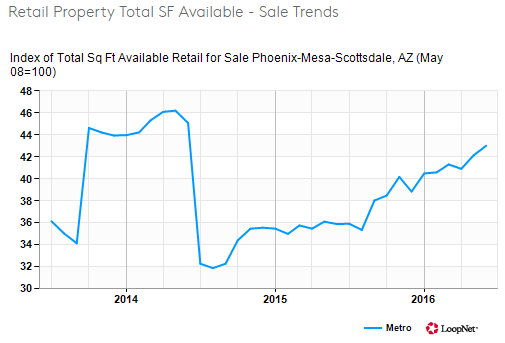 The retail real estate market in Phoenix is lagging compared to other sectors. Vacancies appear as though they may start trending down again this year. The primary factor bringing this market down is the closing of big-box stores in the area due to a loss of brick and mortar business, to e-commerce. The downtown Phoenix area remains vibrant and full of pedestrian traffic ready for unique shopping experiences. If you are interested in buying or leasing retail space, the market is in your favor. 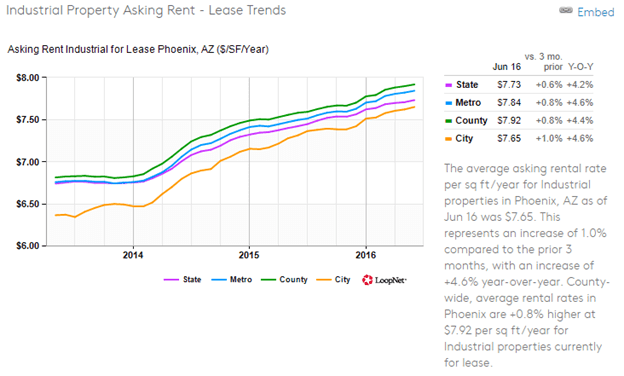 What Sets Apart Arizona When it Comes to Owning or Leasing Commercial Real Estate? The Arizona Commerce Authority has been working to create a friendly business atmosphere for the “Grand Canyon State” since 2011 when Governor Jan Brewer established it by executive order. The focus of the organization has been to attract and retain business and jobs to the state. The Arizona Commerce Authority offers grants and other types of assistance for startups and business relocations. They have worked with the state government to bring business tax rates down and helped to get Arizona ranked as the ninth lowest cost state in the nation to do business. Arizona has the sixth lowest property tax rate in the country and the fourth lowest unemployment insurance tax rate. They have also been working to cut red tape in tax filing procedures and have streamlined the process to cut out the need for tax licenses and multiple audits. The state has even gone so far as to allow businesses in need of crowdfunding to sell equity to the public as well as other firms in exchange for funding. From all of these innovations, it is clear that Arizona is a very business-friendly state, looking to help all stages and sizes of business. Whether you are looking to start a new business or relocate your current business to the Phoenix area, you will benefit from the favorable business climate when purchasing commercial real estate. The smart way to go about finding where you will realize the most significant savings will be to talk to a savvy commercial real estate broker in the Phoenix area. R.O.I Properties offers decades of experience in the commercial real estate industry in Phoenix, Arizona. Our brokers can help you figure out what the individual pros and cons of owning vs. leasing would be for your company, industry, and stage of business development. Call us today. We would love to help you get the best commercial real estate deal possible in the Phoenix, AZ area. Given the array of nonprofit sectors, there are a variety of reasons why an organization may choose to sell all or a portion of their real estate holdings. Charitable organizations, foundations, trade associations, social service organizations, and unions each acquire and utilize property to suit their individual needs. To make the best and most informed decisions leading up to, during, and after nonprofit real estate transactions, nonprofits in each of these areas must consider the possible outcomes and advantages of sale. They should also consider the restrictions that are currently in place for 501(c)(3) organizations that limit excessive personal gain from the sale of property. Doing so will enable them to make the correct choice of when to sell and when to hold onto their real estate assets. Nonprofit organizations, much like their for-profit counterparts, are permitted to buy and sell assets, establish lines of credit, and sign contracts to fulfill their operational needs and meet strategic objectives. They can benefit in a number of ways from the sale of property. Here are five of the most common benefits. Freeing Up Capital. Selling off real estate holdings can enable nonprofits with the ability to free up capital that can beused elsewhere in their strategic outlay. Making those funds available enhances other programs, services, and initiatives. By recapitalizing assets, a nonprofit organization can allocate more funds to expand programming, reinforce staffing, or address other operational needs. Debt Relief. It is common for nonprofit organizations to take on long-term debt at different phases of their lifecycle as a way of financing their agendas. But recent studies have shown the risks inherent in the use of debt financing are often too great to justify it as a method of funding nonprofit operations. These organizations, in turn, are able to achieve either partial or full debt relief through the sale of real estate assets. Right-Sizing. In real estate, space comes at a premium. But if you have too much of it, your unused spaces can be a sizeable financial burden. “Right-sizing” is a practice many nonprofits are pursuing, selling their real estate assets to relocate to a facility that aligns more closely with the size of their staff. “Right-sizing” also helps organizations keep pace with evolving workplace trends. In the past decade, the average amount of office space required per person has decreased by 20 percent. This change is due largely to the use of smaller technology and preference for open floorplans, and has resulted in many organizations moving into smaller, “right-sized” spaces. Branding. As industry standards evolve, nonprofits need to shift their message and branding periodically to reach intended audiences. Relocating to a space that better reflects a nonprofit’s mission helps to not only meet these changing standards, but also to recruit top talent. Cost Control. Heating and cooling old or excessively large spaces and maintenance requirements can add significant costs in a relatively short amount of time. Nonprofits can control these costs by selling outdated property and moving into updated spaces that more efficiently accommodate organizational needs. Understanding these benefits and how they can improve mission outcomes helps nonprofits determine the best time to sell. Due to IRS-imposed restrictions, 501(c)(3) organizations are subject to a number of rules limiting the sale of property. These regulations address both the possibility of an individual abusing the sale of assets for personal gain as well as self-dealing where a disqualified person or stakeholder takes advantage of their position to benefit their own interest. Excess Benefit. The IRS defines excess benefit transactions as any agreement that provides economic benefit exceeding “the value of the consideration received by the organization.” Instances where a nonprofit organization dispenses of real property in a way that provides a financial benefit to a disqualified person qualify as “excess benefit” and must be reversed by means of reparative payment to the applicable tax-exempt organization in the amount of the benefit plus interest. Self-Dealing. For sales or exchanges of property, self-dealing refers to any transaction between a nonprofit and a disqualified person. Whereas excess benefit transactions refer exclusively to financial gain, self-dealing may encompass other types of material gains. Both excess benefit and self-dealing transactions violate the nonprofit principle of non-distribution constraint, the basis for donor trust which prohibits organizations from distributing net gains to administrative personnel, staff, or board of directors. As long as a nonprofit does their due diligence in preparation for a nonprofit real estate sale, they should have no problem steering clear of regulatory issues. If your organization is ready to sell or wants to explore the possibility of a sale, now is the time to get in touch with a member of our expert commercial real estate team. R.O.I Properties has decades of experience finding buyers for nonprofit assets. Contact us today to schedule a free assessment of your asset’s potential.